Any article that is created in Content Station needs to be based on an article template. Because multiple templates can be made available, Content Station needs to determine which one to use. What is a suitable article template? The following figure shows the workflow in the form of a diagram. If the request to create a new article is made from within a Dossier, that Dossier is checked for the presence of any article templates. If only one template is present in the Dossier, that template is used. If multiple templates are present in the Dossier, the user is asked to choose which one to use. If no templates are present in the Dossier, Content Station checks if any article templates outside of the Dossier exist. If a template is found outside of the Dossier, Content Station first checks if the Brand and Category properties of the article template are set to the same values as the values of the Brand and Category properties of the Dossier. If so and only one template is available, that template is used. When multiple templates are available, the user is asked to choose which one to use. 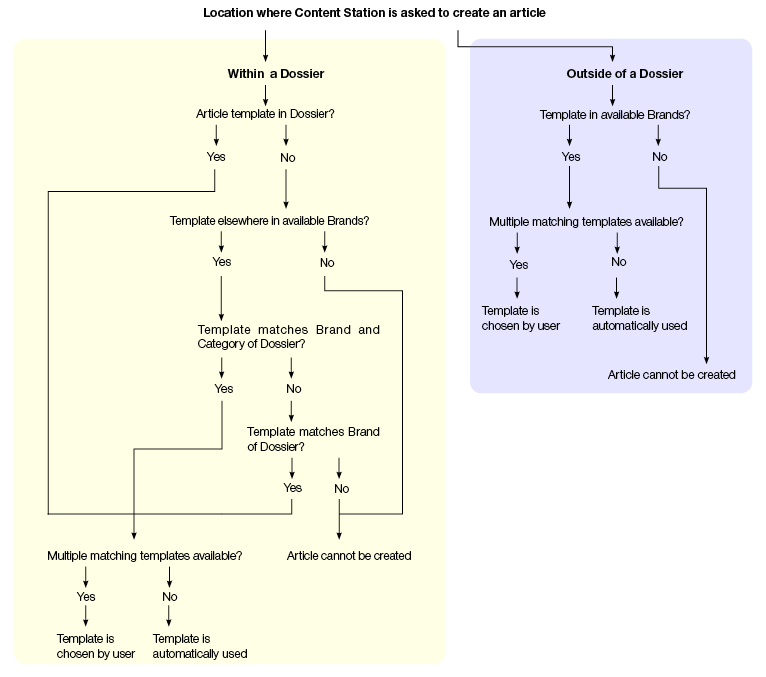 If the Brand and Category properties of the article template are not set to the same values as the values of the Brand and Category properties of the Dossier, then Content Station checks if the Brand of the article template is set to the same Brand as the Dossier. If so and only one template is available, that template is used. When multiple templates are available, the user is asked to choose which one to use. If no templates are found, the article cannot be created. The scenario where the request to create a new article is made outside of a Dossier is somewhat different because no context exists that can be used to match the properties of the article template with. In these scenarios, any template that belongs to any Brand that the user has access to is returned. When no template exists, the article cannot be created.